We have had the wonderful opportunity to design the Group Health Physicians Annual Report for the 3rd year, working with a fantastic team at GHP. This year’s theme was “Our Journey” and came at an epic time of change in the country’s health care system after the Affordable Health Care Act. 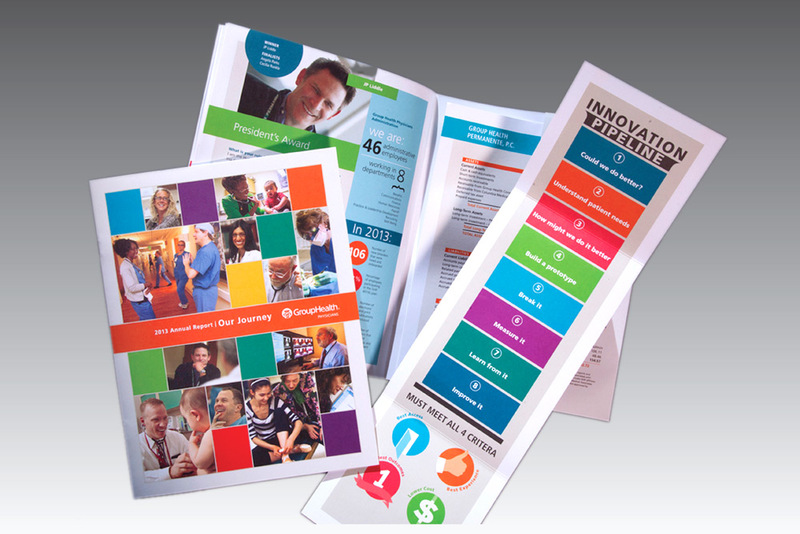 This year’s annual report was very focused on innovation and quality, best patient experience and lower costs. It profiled award winning physicians and their philosophies for commitment to patient care, and their passion for their patient’s quality of life. We learned that the timbre and colorful nature of the piece was very well received. A joyful “journey” of encouraging excellence and innovation in a new era of health care. This entry was posted in print design on October 11, 2014 by Peg Ogle.